Liberation magic, anti-capitalist robots, Medusa-themed puppet theatre, riot grrl dance parties, and the story of stardust accompany the journey of six queer artists and activists touring from Brooklyn through the Midwestern U.S. this April. You’re invited to enjoy the spectacle as these dazzling troublemakers create a world of radical extravagance and thought-provoking glamour. Heels on Wheels Roadshow is a queer performance art cabaret hitting the road April 15-25, 2011, in search of new friends, fantastic adventures and siblings in the struggle. The five fearless performers rampage across the femme/inine spectrum: cis, trans and genderqueer gone hi-femme to femmedrogyny, dandy darling to ladybeast — while serving up poetic theatre, silly buggery, dark whimsical puppetry, and rocknroll you can sink your heels into! The 2011 Roadshow features dazzling troublemakers Heather Acs, Amanda Cheong, Geppetta, Damien Luxe, and Shomi Noise — and visual artist Lixznne Disaster providing powerhouse imagery. 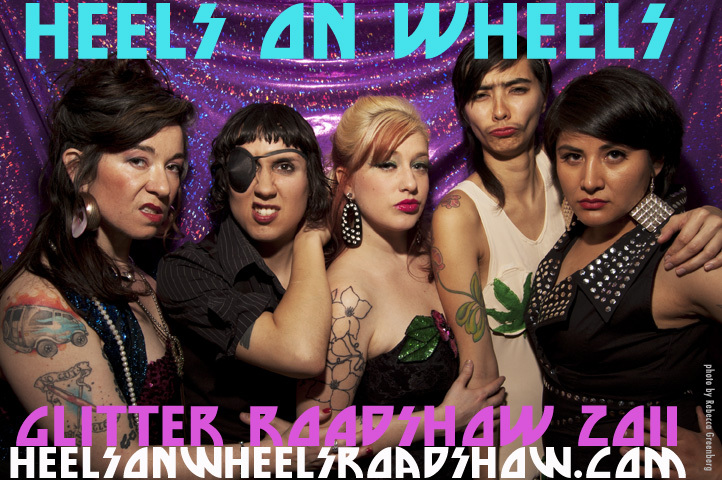 Stillettos fly, fairytales fracture, and queer landscapes explode: the second annual Heels on Wheels Roadshow is coming to your town in April 2011. More details can be found at: www.heelsonwheelsroadshow.com!